It appears that Connect Cafe is out of business. Looking back to the old days, I remember when the internet first came out. It was the coolest, most mysterious thing that all the hip people had. And where did they all hang out when in groups? At an Internet Cafe of course, yet only if you lived in a cool town or the city, and my town growing up had neither. Then WIFI came about as well as laptops, and the fad was dead before it ever came alive on most of the East Coast. But a couple months back I heard someone actually opened a coffeehouse in Marlton with the intent of capitalizing on the internet cafe niche. Thinking the rumor half-joking, I decided to pop in the next time I was in the area. 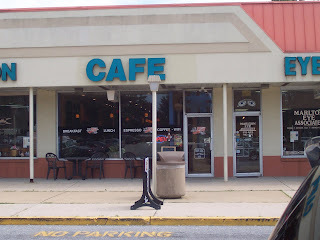 After finding it, labeled "CAFE" (that's eye-grabbing!) in a boring beige strip mall along Rt 70, I soon realized my suspicions were confirmed. The interior has a heavy internet cafe theme (though beautifully decorated), with the drinks labeled "bytes" and "megabytes" to denote the sizes and a policy that you have to buy a certain amount in order to use the internet (I thought that was assumed?). Another side note about the inside is that they have this long, spacious deep-red wall empty of any kind of local art, which seems to be an utter waste. Moving on to the cafe end they surprisingly serve Crescent Moon Roasters, a dynamite roaster based out of the Mullica Hill area. The coffee served tasted a little stale (as if it hadn't been refreshed in a timely manner) but it was decent. On this particular occasion, the espresso was drastically over-pulled by the young barista and the taste reflected it. Didn't observe the tea selection. Overall, I would say Connect Cafe could fill the perfect coffeehouse niche in the area if they lost the internet cafe look (the trend died; leave it be), presented the work of some local artists, and really stepped up their coffee passion (Crescent Moon must offer subsequent training...). So when in Marlton, as there's no other decent coffee to my knowledge in the whole town, give it a go and hopefully things will have improved.